Boring boring boring book which reads like the taped together collection of game accounts it is. Someone owes it to this story to tell it with some flair and behind the scenes intrigue. 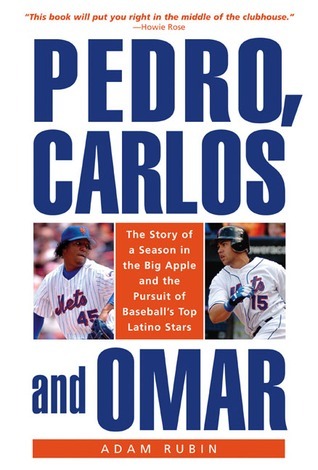 How you make Pedro, Piazza, and Mike Cameron boring is anyone's guess, but Rubin managed it. I think the problem was that there was not much to the story, itself. Minaya needed to turn the team around and Pedro and Carlos were the top two free agents at the time, so he signed them. Although that's not "end of story", it's pretty close. There is much talk about how these signings were supposed to signal the team's commitment to break into the Latin market, but the results of doing so are barely noted. Also, it didn't help Rubin's case that the '05 season was fairly run-of-the-mill, without any huge scandal or drama. Reads like a collection of news articles from the year, which is sort of is, since Rubin is a beat writer for the Daily News. I was expecting more behind the scenes insights and, for lack of a better word, gossip. Ah, the optimism of the Mets in the mid-2000s, what coulda been, and what shoulda been.